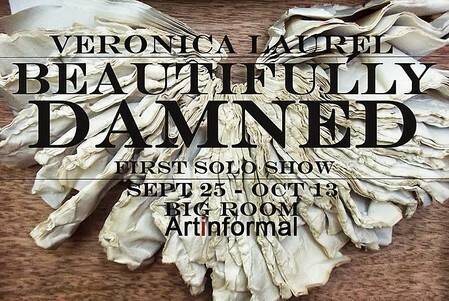 Book artist Veronica Laurel opens her debut solo exhibition titled "Beautifully Damned" on September 25 at the Big Room in Art Informal Gallery. An exhibition depicting the fragile human condition through a fusion of book arts and wooden sculptures. Veronica Laurel presents bookarts as a new genre in the Philippine Contemporary Art with her show. Her first exhibition is a brave introduction and promising beginning for bookarts as a vital genre in the Philippine art scene. Laurel's work delves into the complicated state of the human condition in its chaotic frustrations and fragile undertakings. Under the discipline of bookarts, it opens up new possibilities in the local contemporary art scene as it is a new and an exciting genre that has flourished in North America and Europe. Beautifully Damned as a solo show is a portraiture of human emotions and conditions through sculptural bookart forms, the raw and genuine spirit covered up by society's demanded pretensions. In her artworks are the three main elements that play a huge role in its construction such as paper, wood, and glass. She uses book arts to carry out the essence of the artwork then wood and glass as the vessel, similar to have a body and a soul. The Philippine art industry has many talented artists often falling under traditional disciplines. Veronica Laurel as an artist dares to add a new genre in Philippine contemporary art that can compete internationally. Book arts has been a growing movement globally with more and more practitioners each year and a wide audience but has yet to be grasped in South East Asia. Veronica Laurel is a book artist based in Sta Rosa city. She studied book binding on her own and learned wood carving in Paete, Laguna. 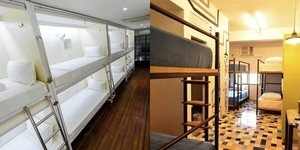 Growing up in a family of carpenters, she developed skills in working with wood. She has exhibited across manila in group exhibitions at venues such as the Ayala Museum, The Tower Club, Blot Art Studio, among others.